THE INTIMACY and openness of the vocal and piano duo concept requires creative focus, confidence and, above all, a deeply shared empathy with the music in order for it to succeed – no hiding place, yet a fascinatingly laid-bare opportunity to express, shape and personalise the nuances of well-crafted song. 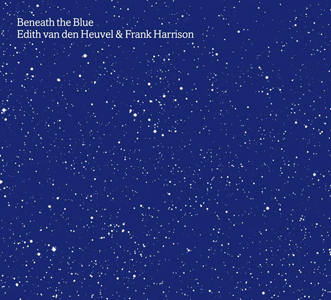 Capturing that essence is a new collaboration between Dutch singer Edith van den Heuvel and British pianist Frank Harrison which sees them exploring and interpreting both familiar and lesser-known gems from the repertoire, recording a moment in time (across a couple of days in the studio) in an album which glistens with warmth and emotional sincerity. The vocal range and clear English annunciation of van den Heuvel are impressive, frequently with an appealing ‘woody’ timbre (not unlike June Tabor), and certainly well matched to Harrison’s highly-regarded pianistic sensitivity as he produces typically lush, complex and sometimes left-field chordal constructions. Indeed, rather than ‘singer with accompaniment’, this project is very much a mutual partnership. Ushering-in the album’s predominant atmospheres, yearning opener Answer Me, My Love finds van den Heuvel reaching out with a considerable depth of expression, the lyrical pain in this 1950s number reflected beautifully by Harrison’s limpid, tenuto piano. The familiar, modulating animation of Duke Ellington standard Caravan takes on a different guise in an inventive, elaborate piano arrangement over which Edith’s voice resonates strongly and deeply, as well as displaying attractive inflections; and the popular Mandel/Mercer tune Emily (also recorded this year on Frank’s trio album Lunaris) waltzes to soft, innocent vocal and equally elegant piano which recalls its favour with Bill Evans. Arguably the most haunting of Michel Legrand’s melodies, The Summer Knows – introduced here by Harrison’s subtle, solo extemporisations on its theme – is carried superbly by van den Heuvel, portraying it’s fragile major/minor melancholy so affectingly; in contrast, there’s an earnestness to the Kaper/Webster tune Invitation (from the ’50s movie of the same name), a particularly fine melding of piano and voice; and delicately full of longing, In The Wee Small Hours Of The Morning magically suspends time. Poignant in a year that jazz felt the loss of the great Kenny Wheeler, the characteristically modest, placid air of resignation in his ‘hit’ Everbody’s Song But My Own (words by Norma Winstone) is affectionally and lucidly conveyed. Cheerfully swinging Lucky To Be Me, from Leonard Bernstein’s On The Town, showcases Harrison’s ear for assured-though-engaging improvisation as van den Heuvel relaxes into its blithe demeanour; and finally, Joni Mitchell’s Both Sides Now is precise in its homage to one of Canada’s most revered songwriters, and affirms the enchantment of this particular musical twosome. Launching on 13 December 2014 (in concert at Salle Robert Krieps, Abbaye de Neumünster, Luxembourg), Beneath the Blue can be purchased here as a CD, at CDBaby (CD/download) and from iTunes (download), or from other online retailers. 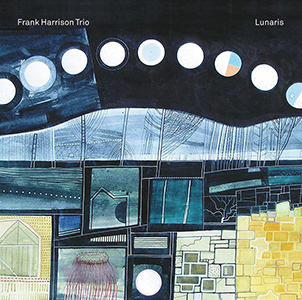 MANY MOONS AGO, Frank Harrison’s pianistic virtuosity and compositional brilliance first captured my imagination. 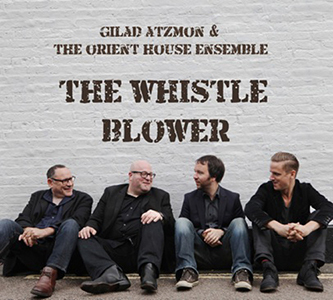 As a cornerstone of Gilad Atzmon’s Orient House Ensemble, and then with his own piano trios, it was Harrison’s perfect marriage of creative rebellion and heart-on-sleeve sensitivity which stood out from the crowd. So, following up 2012’s excellent Sideways (Linus Records), it’s a real pleasure to discover this new trio release, Lunaris, which refines those attributes. There’s a change of line-up as the pianist welcomes the prodigious talents of double bassist Dave Whitford and, on drums, Enzo Zirilli. Between them, they spark something fresh – an approach which includes recurring celestial and planetary themes, as well as references to English landscape and folksong. Individually, the twelve pieces – Harrison originals and interpretations of standards, plus collaborative freestyle improvisations – are attractively constructed mini-masterpieces. Collectively, they form a well-balanced fifty-minute anthology of warmth, exploration, unpredictability and, ultimately, possessing an overriding sense of equanimity. A typically pellucid reading of the classic David Raksin number, My Love and I, opens the album – dreamy and unhurried, Frank Harrison keeps its deep, recognisable melody aloft, bass and brushed drums caressing every nuance. The delicate geniality of Jerome Kern’s I’m Old Fashioned is a joy, ringing to Enzo Zirilli’s precise yet enquiring percussion which varicolours this bright interpretation, Harrison’s customary keyboard poise so tangible. From this opening familiarity of melody, a panoply of astral discovery is unveiled with the first of two miniatures – Stars – its spacial, searching piano chords subtly enhanced by synthesiser twinklings. Continuing the night sky observation, An Evening of Spaceships and UFOs is a remarkable group improvisation which confirms this trio’s new-found empathy. 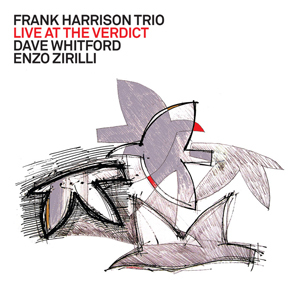 A mysterious deep bass rhythm set up by Dave Whitford has a sonority and momentum reminiscent of Dan Berglund’s work with e.s.t., intertwining with Harrison’s supple, measured chord progressions and solo lines; and, around all this, Zirilli percussively paints vivid streaks of asteroids and shooting stars. Following on, the weightlessness of Io – one of Jupiter’s four moons – is softly imagined via a restrained piano/synth and bass ostinato, shimmering all the while with ethereal and atmospheric beauty (I intend taking these tracks to a dark-sky zone!). Sunrise (Port Meadow) announces daylight with a lilting 6/8 melody which racks the mind, searching for the title of a much-loved standard – but this is another from Harrison’s pen, evoking the natural beauty of Oxford’s ancient riverside pasturelands. The new compositions continue with Ascent, climbing apace and displaying lively interaction within the trio, maybe providing a glimpse of extended development in a live setting; and, at the summit, there are the ominous soarings of The Bird, conveyed by the pianist’s shapeshifting chordal tracery and dark bass octaves. BoRG-58, another group improvisation (its title referencing far-flung galaxies), brings arresting open fifths grooving from Whitford and Harrison (a hint of Esbjörn) and broad, cross-patterned drumming from Zirilli – with understated synth infusions, its a winning combination. The emotion of Frank Harrison’s solo discipline is to be found in a wistful rendition of traditional North East English folk tune The Recruited Collier – assured and clean, with the most sumptuous harmonies, time momentarily stands still. Johnny Mandel’s late ’50s song Emily (a favourite of Bill Evans) waltzes through its several minutes, Harrison and Whitford soloing radiantly to Zirilli’s gently sifting rhythm; and to close, the brief, sustained, Debussy-like Stars II suggests upward-looking wonderment towards an endless universe. Finally, acknowledgement must be made to landscape painter Andrew Walton, whose cover and booklet art so beautifully reflects an album of exquisite musical imagery. 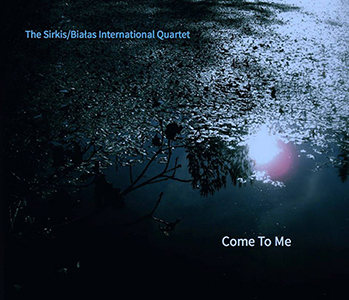 Launched on 9 April 2014, Lunaris is available from all good jazz outlets, iTunes, etc. (audio samples here).